The ViVOpay 4800 contactless reader takes Near Field Communications (NFC) to new levels, enabling not only next generation payment acceptance such as contactless EMV but also adding one-tap check-out from Android Pay, Apple Pay, and Samsung Pay. ViVOpay 4800 allows for loyalty, and couponing solutions for merchants and retailers worldwide in just a one-tap. Its large 16 MB application memory can accomodate emerging contactless and NFC standard applications, and the unique form factor allows users to easily upgrade their existing payment solutions to accept NFC applications. Real-time, touch-based, in-store personal marketing, merchandising and loyalty applications are the new tools benefiting merchants and consumers alike by creating easier and faster checkout while delivering increased savings and improved loyalty to customers. 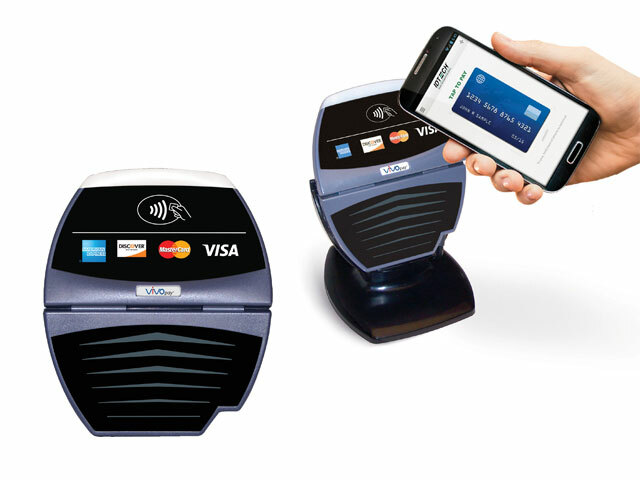 The ViVOpay 4800 allows merchants to drive their customer loyalty and incentive programs using NFC enabled mobile apps. ViVOpay 4800 meets the requirements of contactless EMV and supports a variety of contactless payment applications including, Android Pay, Apple Pay, Saumsung Pay, MasterCard MCL, Visa VCPS, American Express Expresspay, Discover DPAS, and more. mCommerce Enabled: Complete mCommerce solution supports payments, coupons, rewards, and loyalty programs. Enhanced Customer Relations: Increase customer loyalty and reduce the cost of doing business. Ease of Use: Simple to integrate expanded contactless experience to deliver one-tap checkout including payment, coupon, reward, and loyalty solutions. Customizable Integration: Flexible configuration of each contactless application allows adaptation to market needs. Future-Proof: Large application memory, contactless EMV and NFC mCommerce ready to meet customer demand.